Matrix internal parts are a great option for upgrade and replacement parts, and the parts being reviewed today are some of the newest that they've put on the market. Today, I'll be reviewing their helical cut 100:300 torque up gears, steel tooth lightweight piston, and CNC aluminum air nozzle. These parts will be installed in my Snow Wolf Barrett M82, as part of a high performance buildup. I will discuss these parts in this review, so continue reading for more information! I was sent these parts by Evike for testing and review here on Airsoft Retreat. 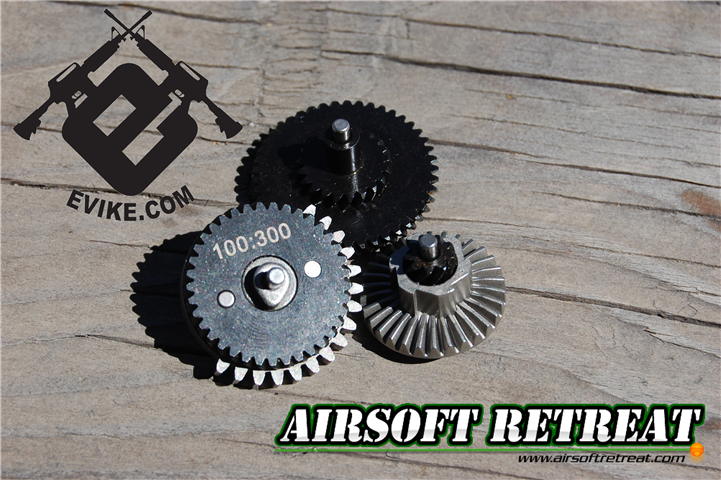 The gears are available HERE, priced at $40, the piston HERE, priced at $22, and the air nozzle HERE, priced at $10. These prices are on par with other high performance parts of similar quality. The items were shipped to me via UPS Ground, and arrived a few days later, safe and sound. These parts are all made of high quality materials, including steel, aluminum, and polycarbonate, using high end processes such as CNC machining. The piston and air nozzle are suited for all types of buildups, including high speed or high power, however, the gears are designed for high power buildups, as they are a torque up design. The gears have a helical cut, which is quieter than normal gears in operation. Normally, with helical cut gears, you need to use half tooth pistons, however, due to the tooth count of this high torque set, you can use it with standard tooth pistons, including the piston I'm reviewing today. Each item came individually wrapped in its own specialized package. The piston and gears were in cardboard backed vacuum formed plastic packs, and the air nozzle was in a small plastic bag, all of which had labels and markings indicating what they were. The CNC steel gears are, as mentioned before, helical cut, and with a 100:300 ratio, as indicated on the packaging and gears themselves. The benefit of helical cut gears are two fold; first, they run quieter than normal cut gears, and second, they benefit from having less force being applied to each gear tooth, as more teeth are engaged on the gears at any given point. These specific gears are made of steel, and are CNC machined for precision and strength. That being said, they can only be used in gearboxes that use standard gear designs, such as V2/3s. The CNC aluminum air nozzle is designed for M4/16/249 guns, or anything else that uses that size of air nozzle. It features an inner O-ring for a nearly perfect airseal, and fits extremely well on the cylinder head nozzles that I tested it on. It did require lubrication before it would slide smoothly on the air nozzle, but once lubed up, it slid perfectly. The nozzle fit very well into the metal M4 type hop-up in my test gun, further increasing the quality of the airseal throughout the whole system. This is my second experience with this specific piston, as my first one is installed in my custom built G&G RPK. It is a fantastic piston, as it combines light weight, due to the polycarb design, but with high strength due to the steel tooth rack. It features a removed second tooth, to assist with smooth meshing at the beginning of the firing cycle. The one I received from Evike had a slight amount of extra material on one of the gearbox rails, and needed to be sanded off slightly to ensure that it would operate smoothly. Other than that little error, it is a great piston for both high speed and power buildups. For my buildup, I put these parts inside my Snow Wolf Barrett M82. A little background on the gun, when I received it, it was one of a handful of pre-production prototypes shipped into the country when the gun was under development. Snow Wolf was then shut down by the Chinese government, but was able to rebuild a year or so later, and the gun is currently on the market at select retailers. In stock form, the gun had a decent gearbox, but low performance, only shooting around 375 FPS. It was in desperate need of a FPS boost, and this kit would have the parts I needed to do it. Additionally, I decided to build a replica of the AAC Cyclops to throw on the barrel, and I painted the whole thing with a tan paint job. Installation was a breeze, however, the gears did require a fair bit of time to get them shimmed perfectly, due to the helical cut teeth. Test results with the new parts, but the stock spring were 401.2 FPS (an increase of about 25), but a drop in ROF by about 4 RPS, which is to be expected due to the torque up gears. The gear noise was noticeably quieter during firing. To test the gears a bit more, I installed an Element M145 spring, which brought the FPS up to 472.6 FPS on average, and the motor and gears didn't even sound like they were straining to pull back that strong spring. Long term durability will be tested over time, but I put about 400 rounds through it so far on an 11.1v LiPo battery without issues. I was quite pleased with this combination of parts, especially when used as a set. The gears work fantastically, and are able to be used with the piston, which can take high strength springs without issue. All of this is topped off with the high quality air nozzle, which gives you a great air seal for any power level. Overall, these parts are all great on their own, as they will work with your pre-existing parts just fine, or if purchased as a group, as they work great with each other. Many thanks again to Evike, and of course, Airsoft Retreat!